Recognize this gorgeous mama? It’s Amy Turn Sharp of doobleh-vay and the crafty mama behind Little Alouette. Amy is the mama to two young sons and is expecting another child. As a former fashion model she’s a natural in front of the camera and has been documenting her recent pregnancy with self-portraits of her maternity fashion forays. So, it was only natural that I would ask her to model the stylish designer fashions of Moody Mamas now available through a special collection made just for Target, with the more attractive price tag to match. Moody Mamas’ collaboration with Target is a great thing! 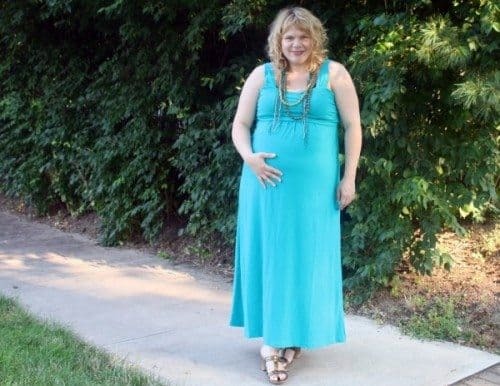 I love this Maxi dress I reviewed because it is a chic and fabulous summer option for maternity fashion at a super price point. The under $50 price makes it a maternity shopping no brainer! I love a comfortable fashionable summer dress that can be versatile. I am able to dress this look up with loads of necklaces and bangles and heels for a summer wedding or date and then throwing on a floppy hat and over-sized sunglasses for casual afternoon shopping with the gals. I was also happy to discover the double secret nursing ruched band across the chest as it is perfect for easy access and comfortable breastfeeding. This dress can be worn from the moment you pee on the stick till months after the baby because of the generous fit and nursing design. The dress is a true maxi and it was a great length– but I am 5’8 and I do think shorter women may have to wear heels or hem this dress. It fits about true to size with a pretty generous top area that will accommodate a pregnant woman’s and nursing mama’s growing bosom. I love the fabric choice because this dress feels like I am wearing pajamas. The bold teal color is great look for summer and I always tend to wear black dresses while pregnant but this color made me sparkle and feel really gorgeous. Thanks Amy for modeling for us. Disclosure: This is an editorial piece and no compensation was received. Moody Mamas did however send us the maxi dress which Amy wore for this photo session. If you’re a designer and are interested in having your clothing featured here on Fashion Friday, drop me a line in the “Contact Us” form. This post is even weirder than the iPhone one. I may have to stop reading this column. When we classified this article under postpartum we didn’t realize that it would automatically also be sent to the Bounce Back column feed. Honest mistake. Apologies.